CEDAR RAPIDS, IA: The transformation is complete. 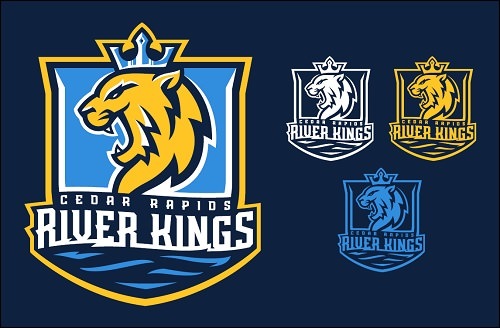 The Cedar Rapids River Kings unveiled their new colors and logos today, and they reflect the team's new identity beginning with the 2019 season. The team announced on August 20 that it would undergo a re-branding from its former identity as the Cedar Rapids Titans. The news followed the Indoor Football League's announcement that Roy Choi and Matt Stone had purchased the team from Chris Kokalis at the end of the regular season. Choi and Stone then brought on former Spokane Empire (and Shock) general manager Ryan Eucker to fill the same role in Cedar Rapids. When the Shock left the Arena Football League following the 2015 season to join the IFL, Eucker oversaw the branding of the Spokane franchise to the Empire. He had spent the past year and a half as vice president of ticket sales for the Normal Cornbelters, and independent minor-league baseball team playing in the Frontier League. The Cornbelters are based out of the central Illinois towns of Normal and Bloomington. upon first viewing, the new logo of a crest featuring a lion colored in bright yellow against a light blue background. More detailed is the appearance of the roaring lion on an anchor donning a crown (hence, River Kings). The bottom of the anchor whos a wavy resemblance of the dark blue waters of a river, presumably to represent the Cedar River which flows through downtown Cedar Rapids. The logo design also serves as an homage to the strong presence of native Czech's who helped settle the area. Also referenced in the design is David W. king, a pioneer of the area who settled the area of Kingston along the west side of the Cedar River. The official colors of the team are navy blue, light blue, and yellow. The logo was constructed by graphic designer Brian Gundell, who has worked with the National Football League's Miami Dolphins; the University of Washington football team; Major League Baseball's Miami Marlins, San Diego Padres and San Francisco Giants; the National Basketball Association's Oklahoma City Thunder; as well minor league baseball and several NCAA teams. He also has worked with several national apparel and shoe brands. The naming came about as a result of a fan contest to re-name the team. Submissions were collected for about three weeks, with a final round conducted over the past week. Jennifer Hadenfeldt submitted the entry of River Kings. She will receive a team prize pack of an authentic 2019 jersey, four logo t-shirts, four logo hats and four lower level sideline season tickets. She also will be awarded an opportunity to accompany the team for a road game during the season. The River Kings announced the hiring of Mark Stoute as head coach in late September. Stoute coached Cedar Rapids for four seasons from 2013 to 2016. He spent the first half of the 2018 season at the helm of the Nebraska Danger, but was dismissed on May 20 following the team's six-game losing streak. The Danger had won its first three games of the season, but had suffered several injuries along the day; the most notable of which was quarterback Damien Fleming who was lost for the season in Week 3. Since his hire by Cedar Rapids, he has added a coaching staff and been vigorous in acquiring a training camp roster. The River Kings are one of five returning IFL franchises from the 2018 season. The Barnstormers, Rattlers, Green Bay Blizzard, Nebraska Danger and Sioux Falls Storm also return. The team also will have some new additions, including the expansion Tucson Sugar Skulls, who were announced in September. The Quad City Steamwheelers and Bismarck Bucks also joined the IFL, having made the jump from Champions Indoor Football over the last two months. We at SCtoC have learned that there is a strong possibility that two expansion teams have been approved join the IFL for the upcoming season, but no official announcement has been made. The IFL's 2019 schedule is anticipated to be released over the next couple weeks. The IFL will enter its 11th season in 2019. The Barnstormers are the reigning champions after winning the United Bowl to conclude the 2018 season.